EMMITT BOOHER: Emmitt Booher is a Native New Mexican, born and raised in Eastern New Mexico. He spent his childhood living and working on a small ranch, which he credits with cultivating his appreciation of the landscape, history, and people of New Mexico. He regularly volunteers his photography skills to non-profit and conservation organizations, most notably Hawk's Aloft and the Dona Ana Arts Council. He has exhibited in group and dual shows in Texas and New Mexico. Emmitt's photographic training with film based cameras, including 4x5 field cameras, and darkroom processing has proven to be invaluable as he transitioned to working with the digital process. His goal is to present photography as an artistic medium. Influenced by work of the masters of American photography, Emmitt's black and white imagery is a natural choice in which to present his work.He is the Artist-In-Residence at the Organ Mountain Desert Peaks National Monument. The first photographer that has been accepted in that position. The residency provides an artist and public an opportunity to interact to better enhance the understanding of the public lands as well as the unique qualities an artists eye can capture.Emmitt and his wife, Rosa, live in Mesilla, New Mexico with their two rescue dogs, L. Diego and Frida K.
LYNDA BRUGMAN: A native of the southwest, I was born in Texas, raised in Arizona and have lived in Arizona and New Mexico. Now settled near La Luz, New Mexico, in 2010 I left a career in information technology to pursue my love for photography. I got hooked on photography during the eighties when I took a black and white photography class while earning a degree in computer information systems. Since retiring, I have taken classes at NMSU-Alamogordo to speed transition to the digital world, and while I loved black and white film photography, the digital dark room provides exciting possibilities that I have only begun to explore. My work is an exploration of the natural world, providing a window through which others may share my deep appreciation of nature and experience its infinite variations and beauty. While my primary focus is nature and wildlife, I always find something interesting or beautiful to photograph wherever I am. My goal is to create photographic works of art that depict the innate beauty of the everyday world we live in. they relate to an image and what it means to them. CAROL MORGAN-EAGLE: Art has been Carol Morgan-Eagle's passion since she was a child playing in her grandmother's art studio overlooking the Pacific ocean in California. Since then, she has continuously pursued her interpretive artistic vision of the world, whether it be as a musician, dancer or photographer. While in school for Fashion Design and Illustration, Morgan-Eagle worked as an intern at LACMA in the Costumes and Textiles Department assisting the curator in photographing the resident costume collection as well as for the “Hollywood and History” exhibit. Later, she furthered her skills working for “International Models and Talent” as a photographer's assistant and stylist for many fine fashion photographers. Drawn by the beauty and mythology of the southwest, Morgan-Eagle and her husband, Daniel Pretends Eagle, moved to the art colony of Taos, NM in 1991, where she planned to become a painter. But it was while working as Creative Director and in-house fashion photographer for Blue Fish Clothing, that she finally realized her own love for the immediacy of the camera's eye. She now works in both commercial and fine art photography. When she's not pursuing the creative muse of photography, Morgan-Eagle is a singer/songwriter who performs with her husband in their band, Bone Orchard. Artist's Statement: “I like to blur the line between what is really there and what I see. My desire is to stir people's emotions, to touch something in their hearts that gives them hope or connects them to that deep hidden part of themselves and spurs them on to find their own inspiration in life. To reveal the beauty or the sacred or the story that is hidden in the ordinary. I find my muse in that which exists around me, of whatever sparks my imagination and sends me on my way to that place of creative satisfaction……inspired by color…shape…texture… and an alternate version of what we think we are really seeing…waiting for that moment when it suddenly all dissolves into this transcendence where the ordinary becomes extraordinary. THEODORE GREER: Theodore Greer was born in Gallup, New Mexico, where his parents and grandparents ran trading posts on the Navajo and Zuni Indian reservations. He started taking photographs with a Brownie camera that his parents gave him at seven. He studied photography and printmaking in high school and at San Francisco Art Institute and the University of New Mexico. He has degrees in archeology and education, and has worked at innumerable jobs over the years. He has traveled and photographed throughout the western U.S., and in Mexico, South America and Europe. He has shown in Jemez Springs, Taos, Albuquerque, Phoenix, Seattle, Oakland and San Francisco. He has taught darkroom and digital photography and the Adobe Creative Suite at the University of New Mexico at Los Alamos. He has had numerous images published in both hard-copy and online publications, as well as print sales to many private collectors. His largest sale was 270 canvases to Presbyterian Rust Medical Center in Rio Rancho, New Mexico. He continues to hear from patients who are comforted and inspired by being able to immerse themselves in a scene from nature while in the hospital. He lives with his wife Donna Lea in Jemez Springs, New Mexico, where He photographs people, landscapes and archeological sites for commercial use, publications, greeting cards and fine art images on canvas. His work can be seen at the Jemez Artisans Gallery in Jemez Springs, Fuller Lodge Art Center in Los Alamos and Tularosa Basin Gallery of Photography in Carrizozo. JIM HARRIS: Jim’s interest in photography began during his college years with a Kodak Instamatic and a flash cube. He works primarily with landscapes and travel photography. He has received recognition and awards for his work on a local, regional and national level. His photos have been published in regional and national calendars and also in regional magazines. He has had exhibitions of his photography in Alamogordo and Roswell and has received awards at various juried photography exhibitions. He is a charter member of the Tularosa Basin Gallery of Photography and has many of his images hanging at the Gallery in Carrizozo. Many of his photographs are in offices and banks in New Mexico and Arizona as well as in private collections. Jim has enjoyed capturing scenes and cultures with his camera in Vietnam, Thailand, Singapore, Indonesia, Malaysia, Sri Lanka, Europe, Mexico, Central America, Argentina as well as throughout the United States. Jim believes that photography should convey to the viewer a feeling of the moment. He tries to convey a visual impact that will stay with the person long after he or she has seen the photo..His camera equipment of choice is Nikon and is currently shooting the D600 and D810. SHERRY HAYNE: Sherry Hayne is an award-winning artist who has been exhibiting her photographs internationally since 1990. Two of her photographs of White Sands National Monument were selected for the Art Binational 2008 exhibit and displayed at the El Paso Museum of Art and Museo de Arte de Ciudad Juarez/INBA. In 2011-2012, she was invited to participate in a portfolio of the Mission San Antonio de Padua in Jolon, CA. In conjunction with that portfolio, her work is now included in the collection of the National Steinbeck Center, Salinas, CA. Hayne is a fellow of the MacDowell Colony, an internationally renowned artist colony located in Peterborough, New Hampshire, where she was an artist-in-residence in 1997 and 1999. Originally trained as a metalsmith, Hayne has been making photographs since 1989. A Michigan native, she currently resides in Carrizozo, NM. Her work is included in numerous private collections. KEN HOFFMAN: Most of the landforms in New Mexico were formed during the Cretaceous Period some 145 million years ago. The region was then covered by vast inland seas where layers upon layers of mud, sand and plant and animal remains were deposited on the ocean floor. Over the many millions that followed, the waters receded and the landforms were eroded into the configurations we observe today. Photographing the New Mexico landscape is a spiritual experience for me. I love the desert and I have come to appreciate the many variations of desert terrain, flora and fauna in the state. The desert and the mountains are quiet and still, evoking a meditative state. If is my goal in photographing New Mexico to capture not only the physical beauty of the landforms, but the spiritual essence as well. I intend to keep traveling, keep discovering and keep photographing this wonderful land. All my photography is film based utilizing a Chamonix large format camera. I work exclusively in black and white and I develop and print in my own darkroom. Nothing is manipulated digitally. JORGE GUADALUPE LIZÁRRAGA: “…there is really no such thing as a dull landscape or farm or town. “I refuse to believe our lives and experience are predestined. Perhaps my ventures andvision will continue to gravitate toward the unknown. A random orbit? Who's to say? Michael began showing his work publicly in 2011. Since then, his work has been displayed in numerous exhibitions and is in several public and private collections. PETER B. RENICH: A successful photograph is essentially a document embedded with a subliminal message the resonates with the viewer. As a Fine Arts graduate of the Kansas Coty Art Institute, I tend to see photography as a tool, a canvas on which to construct my message. While a appreciate a traditional sun-drenched New Mexico landscape, a photograph can also be the foundation on which to construction my own interpretation, a synthesis of what the camera records and the underlying structure. With today's tools, if can be manipulated to emphasize the artist's vision, not a static document, but a signature statement. LYNDIA RADICE: MS (Sp.Ed.) LISW, was born and raised in New York City. She performed as a classical musician in the US and Europe for ten years. For the next twenty years, she provided special education and child therapy services in NYC and the Bronx. In 2001, she lived for three months in the Ecuadorian Amazon and helped an indigenous community start a kindergarten. In 2006, she moved to rural New Mexico to serve as child/adolescent behavioral health coordinator for Alamo Navajo Reservation. She also provided mental health and developmental educational consultation services in Albuquerque and Bernalillo until she retired in 2013. Currently, she is the Music Director for First Presbyterian Church in Socorro, NM. Her drawings and photographs have been displayed in NY, NJ, PA, OH, CO, CT, NV, TX and NM. Artist Statement: Throughout my life, I have drawn, painted, and taken photographs. Music and art are essential parts of my spiritual practice. My approach to art is contemplative and introspective: I strive to see “that which matters.” My move from New York City to the high desert of southern New Mexico nine years ago was a dramatic change from urban to rural environment. I learned to slow down. I now have daily intimate contact with Mother Earth and her creatures. My meditation practice includes long silent walks on my land. I contemplate plants, trees, birds, and insects to deepen my connection with the natural world. I take large-scale photographs of the world around me in rural Socorro, NM. They invite viewers to commune with the spirits of nature. My photographs are a form of “slow art” – if viewers slows down and take the time to closely examine my images, they can enter into relationships with familiar trees, plants, rocks and creatures in new ways. DOUGLAS STANTON: Douglas Stanton was born in Berkeley, California in 1951. His family moved to San Diego in 1965. In 2010 he moved to Carrizozo, New Mexico. 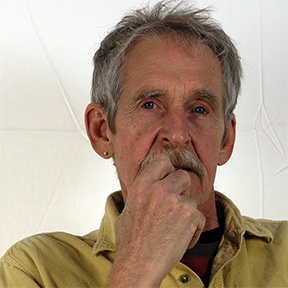 Stanton studied filmmaking, art and photography at San Diego State University and graduated in 1974 with a BA degree. He taught high school media classes in San Diego County from 1983 till his retirement in 2010. Stanton started at SDSU with black and white photography, shooting, developing and printing his own work. After graduating he turned to Kodachrome slide film, shooting with a Canon SLR. While his interest in photography had laid dormant for many years, in 2004 he was assigned to teach a digital photography class leading to a rebirth of his interest in photography. “Digital photography opened up many new avenues of visual creativity”, Stanton has said. He enjoyed the immediacy of digital shooting and the opportunity for post-production manipulation. While teaching he was able to hone his photographic skills and became interested in using his camera to create abstract compositions. Stanton has been a painter since college and his work is often abstract. “I find it is pretty easy to frame and shoot some interesting compositions in a short period of time. It is just fluid and responsive to art making.”, Stanton believes. Stanton has exhibited in a number of venues in California and New Mexico. He has shown his work in the 408 Gallery in Carrizozo as well as the Tularosa Basin Gallery of Photography, also located in Carrizozo. Artist Statement: I shoot photos because there’s an inherent joy in seeing and sharing something that excites the eye, taunts the mind or makes one laugh. I like to share the good things in life. What appeals to me most are bold compositions, especially those based on shadows, lines and patterns. So much of life is worth recording and sharing, especially moments that have a special wonder to them. Wonder is what makes you stop in your tracks and appreciate what you see. That wonder may be in the form of color, composition, light, mystique, motion, humor or simply beauty. When I see something special, I instantly react with an internal “Yes” and reach for my camera. Since I usually have my camera within arm’s reach everywhere I go, I’m always ready to shoot. I don’t leave home without a camera. Life has so many visual surprises awaiting around the bends in the road that it’s a shame to have to memorize them when one can easily capture and save and share them with a camera. Trusting my visual instinct, I like to shoot quickly and analyze later. Later may be in the following minutes as I pursue follow up shots for what else I can find in the scene by zooming in or zooming out, or walking around for different angles. Or later may be on the computer, adjusting the size, color or proportions of the shot. Currently using a Panasonic Lumix FZ-200 mirror less camera with 600mmm telephoto capability, idea for reaching distant subjects & for-shortening for graphic effect. Background: New Mexico resident since 1972. Born in England, raised in Kenya, migrated to NM after college back east. WAYNE SUGGS: Wayne Suggs is an award winning photographer who has photographed landscapes for over 40 years. A New Mexico native, who at an early age, was introduced to the wonders of nature by parents who knew the importance of having a relationship with the Great Outdoors. Wayne captures the beauty of the Southwest and shares his images not only for others to enjoy, but to help increase awareness of the necessity to preserve our precious surroundings. Wayne has won numerous awards for his photography, including the 14th Annual New Mexico Magazine Photographer of the Year, the Oliver Award for his work on night photography with petroglyphs, and numerous others. His work can be seen in national, state, and local publications such as New Mexico Magazine, The Reflector Astronomy Magazine, New Mexico Travelers guide, the Wilderness Society, the Organ Mountain Desert Peaks National Monument Book, to name a few. His work can also be seen in galleries around Las Cruces and the Southwest. SALLY THOMSOM: Sally Thomson is a freelance documentary and fine art photographer based in Placitas, NM. Her passion lines in creating images that focus on rural environments and traditional cultures that communicate a strong sense of place. Her photographs often reflect her background in landscape architecture. Environmental conservation, and explore issues related to the human condition and natural world. These images represent a sampling from several bodies of work that are typical of style and approach to photography. Sally’s work has been commissioned by individuals, private corporations, and NGO’s. Her work has appeared in galleries, newspapers, annual reports, magazines and various other print and web-based media. Some of her clients include: The Vermont Rotary, Hands to Honduras Project; Santa Fe International Fold Art Market, Santa Fe New Mexico; The Seventh Generation Institute, Beaver Restoration Project and the Pike Project, Santa Fe, New Mexico, The New Mexico Land Conservancy, Santa Fe, New Mexico; The Southwest Livestock Alliance, Santa Fe, New Mexico; The Friendship Association –Baracoa, Cuba/St. Augustine, Florida. PHYLLIS WEBSTER: Phyllis Webster is an award-winning writer and fine art photographer who lives part time in Ruidoso, New Mexico and part time in Granbury, Texas. Her early photographic training was in photojournalism and her career experience was in journalism, public relations, marketing, photography, broadcasting, fundraising and special events. She holds a Bachelor of Arts degree from Stephen F. Austin in Nacogdoches, Texas. After her communications career working for a local National Public Radio /Talking Books affiliate, a Dallas public relations firm, several large medical centers and an international insurance company, she launched her own public relations business, assisting clients in diverse fields such as workers compensation insurance, pharmacy, real estate and adoption. In 2013, she established a Gallery of her work on Fine Art America and co-launched a photographic & travel venture called Snap and Scoot. She also leads the Camera Club in Granbury. In January 2015, she participated in a professional portfolio review, where she was encouraged to focus on fine art images. In March 2015, she was the featured artist for Granbury, Texas and had her work on display at the Visitor’s Center. Phyllis’ images are now on display in the Tularosa Basin Gallery of Photography in Carrizozo, New Mexico. Phyllis enjoys traveling the world in search of beautiful and unique images with her husband Jack Lawless. Her camera has gone with her to amazing places such as Africa, New Zealand, Cuba, Italy and China. She enjoys capturing people, wildlife, landscapes and architecture. As a Master Gardener with several specialist certifications, she is also intrigued with photographing nature, particularly with a macro lens. She has written a weekly award-winning horticulture column for the Hood County News since 2001. Phyllis is active in her church and the community, having served on several local boards. Her photographs have been accepted into many shows, including the Rio Brazos, Brownwood and the LGAA, where she has also won several awards.